Members of the TAFE Community Alliance were joined by concerned teachers, students and political parties in meetings in Western Sydney on 21 February. The message that TAFE is the number 1 provider of vocational education and training in NSW, and the State Government needs to restore funding to TAFE and to put an end to policies such as ‘Smart and Skilled NSW’ that will cut the number of TAFE courses offered in Western Sydney was supported. In Western Sydney, TAFE is valued for its ability to deliver courses which meet the needs of students, including those who are disadvantaged and require additional support. TAFE delivers courses directly in the community, and works with local groups to build the skills and knowledge needed for people of all ages to gain a successful career. TAFE still has the capability to provide student support services including multicultural, counselling, libraries and Outreach, to assist students to succeed. TAFE’s record in providing skills for individuals seeking to upgrade or change careers, particularly in new and emerging industries, is well known. It is these quality educational provisions that the short- sighted cuts by the O’Farrell government and the proposed changes of ‘Smart and Skilled’ NSW, put in jeopardy. The Alliance welcomes the Greens ‘TAFE Changes Moratorium’ Bill and urges all members of the State Government to support the Bill and their local TAFE colleges. 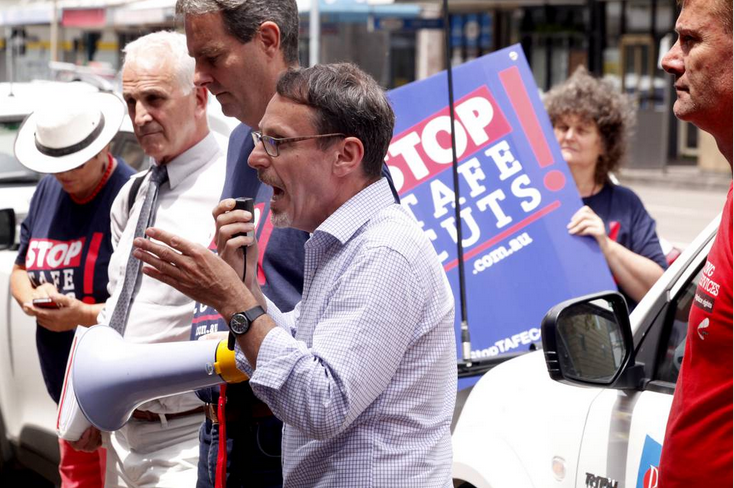 THE chant "Fund TAFE art" was shouted from TAFE NSW Hunter Institute yesterday as students, teachers and politicians protested government cuts. Over the past 12 months 55 jobs have been lost from the institute. What did the Federal Minister have to say about the skills and training system? 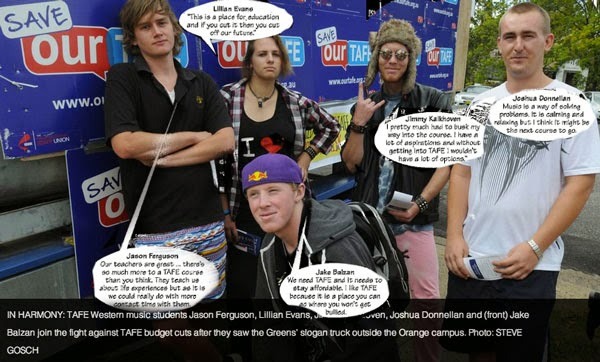 The TAFE Community Alliance suggests that the answer is quite clear about the need to properly fund and support TAFE, rather than continuing to undermine it. The Minister for Industry, Ian Macfarlane says that skills and training needs significant reform and better targeted spending to fix serious structural problems. Speaking on ABC Radio National Breakfast last week, the Minister described the skills and training system as a “convoluted mess” left by the former government. Planned reforms were needed “so that we are actually producing skilled people who are literate and numerate” and able to make a productive contribution to the workforce. The Minister hosed down any suggestion that the upcoming budget would see increased funds for areas such as training, TAFE or apprenticeships, saying there will be “efficient use of the money that’s there”. “I can guarantee that the skills training that will be offered will be of a higher calibre and will present workers that are better ready, better work-ready, than we have seen in the past,” the Minister said.